We’re into May and the start of the summer’s action is now only days away. 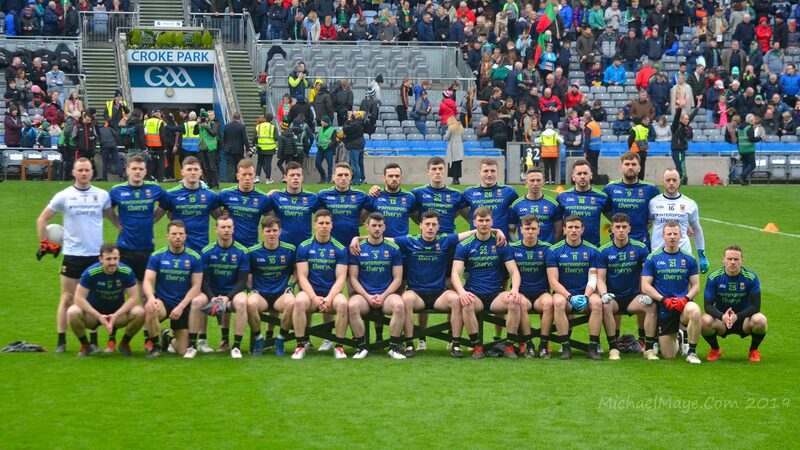 The 2018 Connacht championship was officially launched earlier this week and Mike Finnerty was there for the Mayo News football podcast with his mic and his recorder to get the views of a number of those who’ll have an active say in how this year’s Nestor Cup title race plays out. In this episode of the podcast, host Rob Murphy and I chat with Mike about all the action that’s about to get underway. Then we hear from the provincial championship launch where Mike speaks with David Clarke, Galway’s Damien Comer and Stephen Rochford. Other agenda items covered in this episode include the ladies’ league decider against Dublin on Sunday and how Tomás Morley is readying the county’s U17s for their Connacht championship campaign. We’re delighted to announce that the Oxford Arms are back on board to sponsor the podcast this summer. Is it too early to ask Tom to start making plans once again for us to come over and do the final preview in Camden Town? This edition of the podcast is now available to listen to on iTunes and SoundCloud. Alternatively, you can listen to it directly on the Mayo News website or here on the blog, using the player below or the one on the panel on the right. This podcast with David Clarke and Stephen Rochford is yet another reminder of how special this team are . I mean is there a nicer man or better goalkeeper anywhere than David Clarke ? Or a better man than Stephen Rochford ? No , I don’t think so either. Oh give me these men of Mayo any day at all over all others. I am so filled with deep pride for these representatives of the greatest county . They are family and they are a fantastic example of how to be fearless , resilient , committed , relentless , modest , focused , open , transparent , kind , fair minded , loved and above all human . I love this team and management and I do feel this is going to be their greatest year. Thanks to the team for one of the greatest gifts that make life worth living . Thanks to you Willie Joy for your amazing efforts to bring our county men together in one place from all over the world . I’m going to marvel at their work rate and commitment to the cause. Looking dejectedly out of the pages of the Indo was a scary picture of Magoo . He looked sorry about something. Like , very sorry. Maybe in advance ? On a deeper level though the image was haunting . Was this “wait and see” a metaphor wrapped in some opaque Taibhdhearcian mystery ? Was it a Gaelic version of Godot where he played Vladimir waiting for something that never came ? Mayo people could definitely ( for now )relate to that. Or did it in fact indicate that he was literally just waiting for the optician ? Indeed it was ‘prolly all of the above , Colm Keys article pointed out . But Walsh also took a paddle board to Massive Blasphemy in the Indo criticizing the “lazy pundit “ This comment was way below the belt towards his fellow county man . At best it was worth a 1 out of 10 on Blasphemy’s Heath-Robinson ratings contraption. Blasphemy was no lazier in his analysis than the Skelpies. Even sitting down Walsh looked impressively taller than most of the Aran men and definitely , by some margin ,taller than a Connemara pony. He was , as usual ,full of it , calling Mayo the second best team in Ireland. He intended that comment as a minor slight but tbh no offense taken. He thought to himself I’ll have to work a little more on the head stuff . That Rith na dTairbhe gig down shop street ( running of the bulls )didn’t work either only scaring the sh1te out of the locals. Comer got a head of steam going and started repeating over and over like a mantra “ we can win the All Ireland “ What wasn’t clear was if he was talking about amateur boxing or GAA ? But to suggest that Galway were a dirty team was well wide of the mark , he thought . However as he pointed out in the article “ perception is reality “ and there was certainly an element of paternal pride in his Tally(ing) up the prolific numbers of red cards and eight week bans that Galway had kindly accumulated on behalf of other teams ( including Mayo ) during the league campaign. What he had a blind spot on ( pardon me ) was the converse :that reality was / is perception . That would continue to elude him despite being not difficult to grasp . You didn’t need to go to NUIG to figure that one out. No , he looked like he could be apologizing in advance for the reality of the upcoming Ulster style game of “ no surrender “ about to infect Connacht football at a time when this approach to “ purely defensive football “ had been widely discredited. We would all just have to wait and see . Theres doesn’t seem to be a whisper coming out of the Mayo camp these last few weeks, bar Rochy and Clarkies interviews for the papers Tuesday, its like a calm before the Storm judging by history theres always seems to be a huge game in Mayo when its like this. In contrast to the Bullish Comer in the Media and the news that a number of Corofin players turned down Kevin Walshs invitation to the Galway panel in the last few weeks and Galway been more under big Media spotlight now after a very good Division 1 campaign brings alot of added pressure on Galway going into May 13th. Willie Joe , my apologies . I just noticed my typo above. Agreed Backdoorsam! The dedication shown by the team and management is unreal! True class, great role models, God bless them all! Loved the line about Tom engineering the return of Sam to Castlebar! Roll on May 13, the 16th man will be there with color and noise!!! Maigh Eo Abú!! Looking forward to the season ahead and I have an instinct that we can beat Galway next week. However, when all is said and done about the league campaign and notwithstanding the emergence of C Crowe and E O’Donoghue, the two concerns for me would be the lack of a specialist full-back and athletic young midfielder coming through. In the last 15 minutes of the AI final last year we tired in midfield and K McCarthy took full advantage. May be someone can be converted to midfield for the cship (e.g. D O’Connor, C Hanley) but its a pity that J Gibbons doesn’t seem to be able to make the grade. C Crowe might be an option at FB but I’d like to see a ‘Kevin Cahill’ type FB coming through. BTW, I think Crowe is the best option to mark Comer – not sure anyone else is really suited to marking him. Evan Regan and James Durcan were meant to be very impressive in recent challenge games against Donegal and Monaghan. I would like to see Young Crowe from Garrymore deal with Comer think he has the aggression and strength to stay with him, think the man marking role suits him.Very Impressed in the way he went about his business on Paddy McBrearty in Ballybofey he only got 1 outrageous point from play from way out in the corner. Think the half back line should pick itself with Leeroy out Boyler Barrett and Durcan should start but Rochy does a soft spot for Coen alot will depend on Barretts and Vaughans fitness and game sharpness.Would like to see Shane Nally play but he didn’t get much game time in League playing very well for his club in recent club games at Midfield. Would like to see Paddy Durcan square off with Shane Walsh 2 speed merchants.Stevie Coen picked up Walsh in the League and he just left him for dead numerous times. Midfield will be vital Tom P ,Seamie and Aido will need to be on there game.I would have Aido on Paul Conroy on every occasion I have watched them through the years Aido has always had the better of him and I just don’t like Conroy either he is always whinging and moaning and never does it on the big day. Tom Parsons should pick up Cooke who does switch in and out with Conroy at Midfield, while Seamie should take the spoiler Duggan from Annaghdown. In the Forwards after Aido, McLoughlin D’OC and Andy there is 2 positions up for grabs.Well if Cillians fit he plays.Dohertys form in the League has been poor only 2 points from play in 6 matches while Regan, Loftus, Dougie and James Durcan are all pushing hard for places. I would like to see Dougie play If Cillians is out he is the best long range free taker in the County with Cillian, but then again Regan would be vital for left footed frees against a Blanket defence team like Galway.This game I think could come down to frees cause Mountbellews Barry McHugh League form was flawless up there with Dean Rock and Cillian. I see rte are showing 31 games this summer. Sky are showing 20 (14 of them exclusive) including 2 all ireland quarter finals. was Jason gibbons cut from the squad? I see on Lee Keegan’s Instagram that he was at a driving range yesterday. A great way to mess with everyone’s heads about the severity of his shoulder injury. Fair play to him. My mate, Dublin Dave, is just after telling me that Dublin Mary is the whistler for the ladies game on Sunday, oh here we go again, another con job. Looking forward to the if kick-off this weekend. I think Newyork could beat leitrim. I was talking to someone in the New york camp this week and tbey are very confident. They have a host of county players and a few on the bench aswell . Not sure if leitrim lost would they be out of the championship? Also think London will put it up to Sligo. But the Years men are a division higher and should prevail. Next Sunday is the big one of course. It’s a super 8 qualifier I think as the winners would have to win only one serious game to reach super 8. I am more confident as the game nears about Mayo s chances but Galway on form and with our injury concerns should be favourites. Rain forecast next week for castlebar from Tuesday to Saturday. Pitch will be a right mess for Sunday. Two things on observations from above. Genuinely feel what KW and Damo said in media time is accurate and they actually believe what they are saying. Very balanced. We don’t do Kerry cute hoorism. Ye should know that at this stage. Also its a myth about the blanket. All teams have traces of it. Anyone who was at the league final could see the Dubs having 13 players in their own defence at times. But what they do well is break fast with guys off the shoulder. Not rocket science. Just the way football has evolved. Well said KC. It’s all about defending your own D and attacking the opposition’s D with pace. A wet miserable day would suit Galway no end, as our long kick passing game is alot easier to execute on a dry sod. Galway should be the favourites for this after they’re excellent league campaign. Comer and Walsh are All Stars in the making this year, hope the qualifier draw would be good to us, not the end of the world either way. They’re not favourites, MayoDunphy – we’re 4/6 with Paddy Power to win. And I’d be very wary about anointing anyone as an All-Star in early May. Surprised at that Willie Joe, was sure they were favourites, especially with all the talk of sam coming out of they’re camp :). Must compliment you on the Archive section of this blog, its a world class service, dunno how you compiled it all together. Great tool to settle bets etc, Keep up the good work. Bookies aren’t usually swayed by big talk, Mayo Dunphy! Thanks re what you said about the results archive – it was a labour of love and took several years to do but it became an itch I just had to keep scratching. I had help too, others joined in as it went along and sped up the job considerably. Chris kelly what Galway team do you see lining out? Really looking forward to this game will be watching it with a Galway friend he is pretty confident. I think we can do it but I do worry about the strength and depth in the squad further down the line. You can see it now with Leinster and the strength of their squad and lads coming off bench seamlessly and making an impact. That was where the all ireland was won and lost last year and will be same this year. Have we enough of strength and depth coming off bench?